2016 now has seven $300 million+ movies to its name, beating 2015's record by one, and we've got more on the way. August brings one major contender to join the list, towering high above the rest of the month's films, genre entries of one sort or the other, most of which seem divided into roughly the same mid-level box office bracket. The unquestionable alpha dog of August 2016 is this buddy movie headlined by a group of bloodthirsty DC supervillains (perhaps in the tradition of Marvel's never-made The Sinister Six). And while the studio's recent releases (Man of Steel, Batman v Superman) have produced somewhat mixed results, I have a soft spot for the burgeoning DC cinematic universe - their films allow the kind of imperfections that sometimes create brilliance. Suicide Squad's trailers open by announcing a version of the dilemma that has befallen superhero films in recent months: "What if Superman... decided to fly down and rip off the roof of the White House... Who would have stopped him?" It's a good question, but by the end of the film, they're presumably still trying to answer it, because a physical confrontation between Superman and any or all of this film's lead characters would be very brief and very painful. 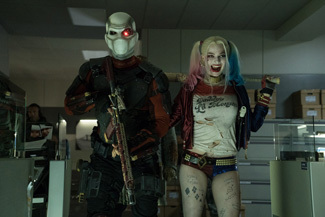 Suicide Squad is helmed by David Ayer, maker of macho or pseudo-macho (I can never tell) titles like End of Watch and Fury, even if Suicide Squad is rated a soul-killing PG-13, undeterred by fellow anti-hero Deadpool's recent ascension as one of the highest-grossing R-rated films of all time. The team of no-gooders is assembled by the intriguingly poker-faced bureaucrat Amanda Waller, played by Viola Davis, and features the ever-genial Will Smith, surrounded by an army of up-and-comers of one stripe or another, and possessing varying degrees of villainy (of course, no character played by Will Smith can ever be truly evil, a universally understood truth the film doesn't seem to challenge). As I watched the Smithless Independence Day sequel collapse just barely over the one hundred million dollar mark last month, memories of the glory days of Smith's reign atop the summer movie box office came flooding back, and just in time for his comeback: Suicide Squad ought to be Smith's first big blockbuster since MIB III in 2012.